The first auction, M.U.S.C.L.E lot with class A, is probably the most interesting auction this week – and one of the most interesting types of auctions to watch in general. Why? Because: (1) there is a Class A #156; (2) it is in a decent lot; and (3) it has a fair starting price for the quality of the lot. 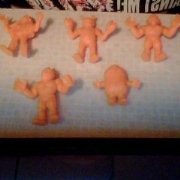 Inexperience M.U.S.C.L.E. collectors often equate a Class A figure to a high dollar value. Experienced M.U.S.C.L.E. collectors know that is not always, and maybe even rarely, the case. #156 is not a popular sculpt. If it had been sold by itself it might not have even sold for $9.99. Of course, that gets thrown out the window if two crazy, spend-happy Master Set (every poster figure, in every color) collectors both need the figure. The stars of this lot are more likely to be the Red #153 and various Sunshine (Brick) figures – especially the counterfeit #64. These figures will likely attract a good number of bids. With a Class A #156 included in the lot it will be interesting to see if, at the last minute, a bidder rationalizes a very high bid because they can sell the #156 to offset the cost of the auction. The heat of auction battling, mixed with a good lot, and the hypnotic label of a Class A figure will probably elicit a higher than expected final price. The final price of this auction will be $41.50. 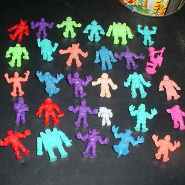 The second auction, Vintage 1980’s Lot of 160 M.U.S.C.L.E. Muscle Men, is for the gamblers. There are three things that make this auction a good bet. If the opening bid ends up being the final price too, then 160 figures could be purchased at $0.50 per figure. The inclusion of a Future Strength figure in the lot and a difficult to identify smaller figure could suggest there are some great treasures in the unseen 131 figures. 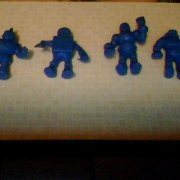 And the question could also be asked, does the roughly 5 to 6 hour distance to western Canada mean some Class A figures are part of the unseen 131 figures? Conversely, there are two main things that make this a terrible bet too. An $80 opening bid on a largely unseen lot of figures seems flat-out stupid. Did the sell hide the badly damaged 131 and only shoot the 29 undamaged figures? 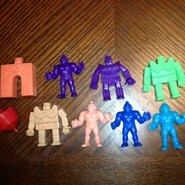 The seller states that these M.U.S.C.L.E. figures were her daughters. That’s not bad. But that statement, mixed with the C.U.T.I.E. in the picture is very troubling. Are the remaining 131 figures actually C.U.T.I.E. figures? It seems unlikely this lot will sell. Unless a gambling M.U.S.C.L.E. collector comes along. The next three auctions are simply baffling. Being a M.U.S.C.L.E. collector has lots of high points and low points. It’s mostly clearly illustrated in the wide variety of auctions that appear on eBay. 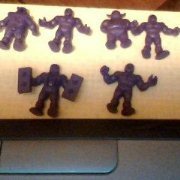 One week it can be the discovery of a new Non-Poster figure, and the next week a lot of 50 Purple #180’s priced at $2,000. The absurdity of these three auctions is pretty apparent. If any M.U.S.C.L.E. collector can provide a logical rationale, then please post it in the Comments section below. 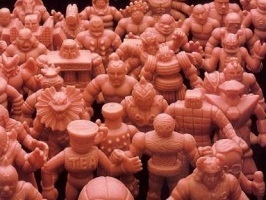 Is a sealed M.U.S.C.L.E. 28-pack the most boring sealed item of all-time? Once the confirmed contents of the 28-packs had been discovered was there any reason to care anymore? The difference between a sealed and unsealed 28-pack is a small piece of tape. It’s an attribute that you can’t highlight in any way. A sealed 28-pack looks exactly like an unsealed 28-pack. That’s not the case with 4-packs or 10-packs. But my lack of 28-pack enthusiasm does not seem to be the exception. It seems to be the rule. Collectors often send me pictures – 4-packs, figures, bootlegs, etc. The one area people don’t care about, 28-packs. I’ve received one 28-pack picture since 2009. Regardless of personal feelings or levels of enthusiasm, collectors still like adding 28-packs to their collections and this seller has three in excellent condition (which is far more important than a piece of tape). 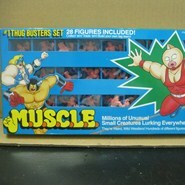 With $9.99 opening bids for these 28-packs a M.U.S.C.L.E. collector will be upgrading or adding these boxes to their collections. The final price of the 28-pack auction will be $17. This entry was posted on Wednesday, August 8th, 2012 and is filed under Auction Watch, UofM News. You can follow any responses to this entry through RSS 2.0. You can skip to the end and leave a response. Pinging is currently not allowed.